Steven (Chicagoland, United States) on 18 February 2008 in Plant & Nature. Site of what used to be my brother's home. 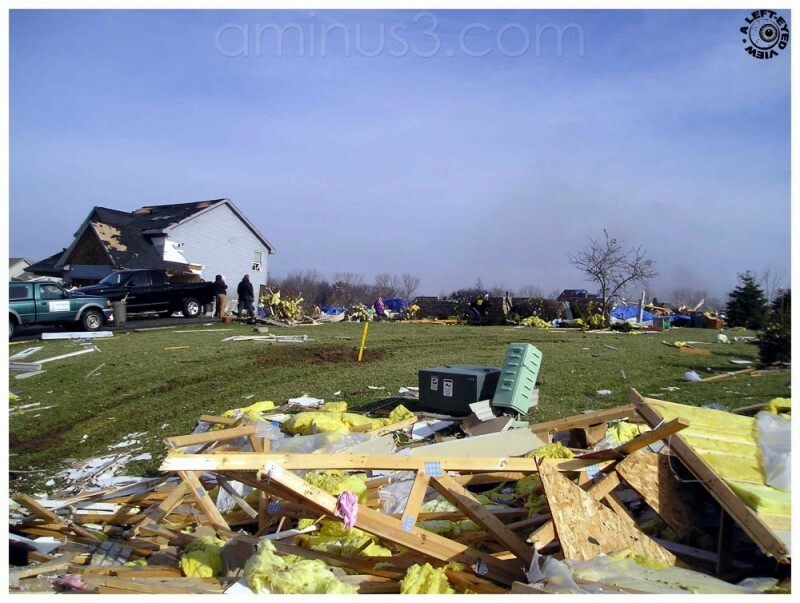 The home took a direct hit by a tornado that tore through Wheatland, Wisconsin on January 7, 2008. Yes, January! No one was home at the time. The home still standing in the background was unsalvageable after it was pushed back 10'-0" off its foundation. The home on the other side was left standing, but was also unsalvageable. Rebuilding of the house started almost immediately thanks to a foundation that was left intact. As of this date, the new roof has been completed and interior work will soon begin. The green grass and sunshine looks like this may have occured during the summer until you see the barren trees. Photo taken January 8, 2008. OMG! Steven, it's a blessing no one was home and thank goodness your brother and family are safe. A powerful reminder of the other side of nature. A tragic example of nature's power! I hope everyone was okay and darn, this is bad... Luckily i do not have tornado in my country...YET!? Amazing the amount of damage. So lucky no one was home. Oh, what a mess! Good luck to you and your family! Wow, tornadoes scare me so much more than hurricanes. I think it's the suddenness, and the focused total destruction. I'm also glad your brother and family were not at home when this hit. Thank God no one was home at the time, but what devestation. I hope that the rebuilding goes well and that you are all safe and sound in a nice cozy home before too much longer.